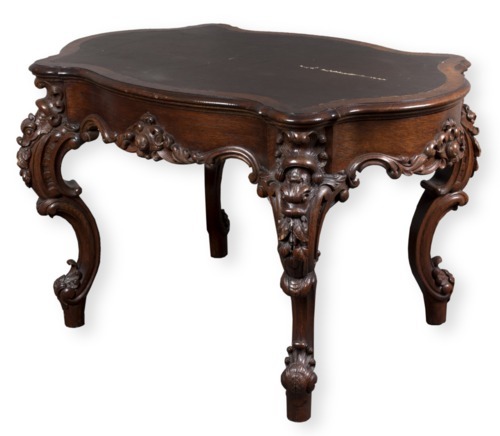 This Rococo-style oak table once belonged to Thomas Carney, the second governor of Kansas. The table features a vinyl writing surface (not original) and cabriole legs with carved dragons. Born in Ohio, Carney came to Leavenworth, Kansas, in the 1850s and established a successful business. He was elected Governor in 1863 and served until 1865. Effie Hiatt Van Tuyl, another Leavenworth resident, later acquired the table and gave it to the Shawnee Mission State Historic Site in Fairway, Kansas. Mitchell & Rammelsberg, a furniture company in Cincinnati, Ohio, manufactured the table.